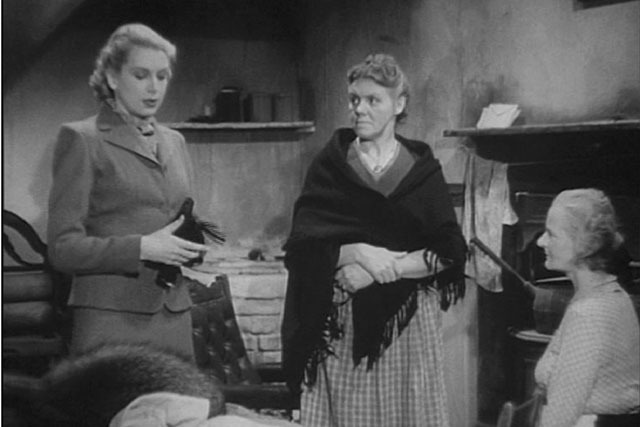 Guest blogger Howard Curle follows up his previous account of William K. Everson’s class on British Cinema at New York University with an in-depth look at one of the movies Everson introduced him to: John Baxter’s Love on the Dole (1941). One of the opportunities afforded by Bill Everson’s course on British films which I undertook at New York University in 1978 was to study a number of older films for the first time and discover aspects of that national cinema about which I had only cursory understanding. Everson insisted on our seeing not just canonical films – those by Hitchcock, Reed, Lean and Powell, the latter having just come into his own as a rediscovered master, although always a favourite of Everson’s – but also so-called programmer films. Among these lower and medium-budgeted movies, mostly genre films and mostly with casts of actors unfamiliar to us but about whom Everson always had a ready anecdote, were those by journeyman directors whose careers never attained prominence but who nevertheless were worth exploring. Dave Kehr appears to have initiated such a survey of ought-to-be-better-known directors in the pages of Film Comment and perhaps some portion of the reminiscence I’m indulging in here regarding Bill Everson can serve a like purpose. 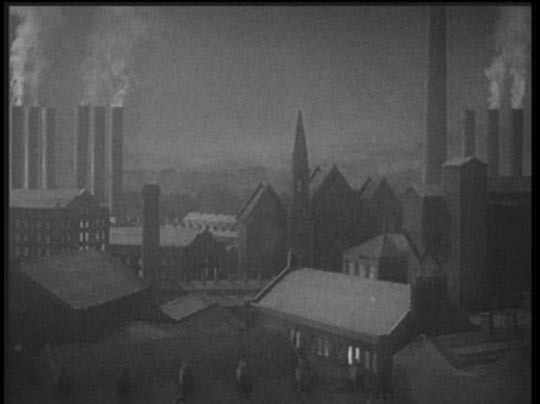 John Baxter’s Love on the Dole (1941), adapted from Walter Greenwood’s 1932 novel (and from Greenwood’s own stage adaptation of 1936, co-written with Ronald Gow), is set in a coal mining district of Manchester called Hanky Park, a grim studio-bound circumference introduced after the opening credits with a steady downward tilt of the camera. 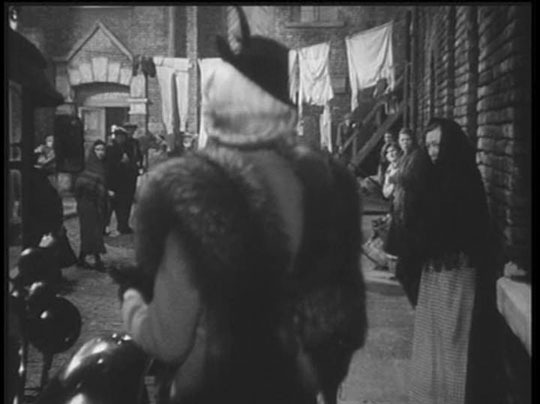 (There are no subterranean mining scenes in the film but this initial camera movement will suffice to convey conditions which envelop the characters.) The area consists of cramped homes, a popular pawnshop, a pub, and the entrance gate of the mining company. These locations are all connected by gutter-lined narrow lanes which recall the French poetic realist films of the late 1930s more than they do the sunlit exteriors and expansive domestic interiors of the Welsh mining community in John Ford’s How Green Was My Valley (1940). 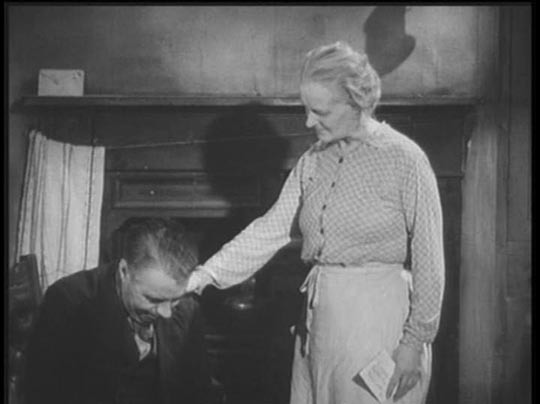 Although Love on the Dole was, according to the most substantial print commentary, “by far Baxter’s grandest production,” the film looks modest in scope. It uses, for instance, library footage inserts to convey point of view shots of a rushing train and the flight of a hawk as well as a vacation to Blackpool including back projection of a rollercoaster. The disjunction between studio and on-location shooting, rare now and hence more noticeable in older films, is sometimes rationalized by suggesting that characters are cut off from experience outside the confines of their (in this case) working-class lives. I don’t really think this kind of reasoning is necessary with Love on the Dole because for all its strategies of economy it succeeds as a radical expression of working-class life. On a crucial level, Love on the Dole is a family melodrama. Significantly, it begins in the home of the Hardcastles, the mother (Mary Merrall) up at dawn, the fire already lit before the father (Baxter veteran George Carney) arrives home from the night shift. Although the film will also end in this kitchen/living room space with the mother and father, the shift upstairs to the two children (via the father banging on the ceiling below with the sharp end of a broom) introduces them as the main carriers of the film’s action. Daughter Sally (Deborah Kerr, just 20 in only her second film) lights a bedside candle against the darkness that still prevails and her brother Harry (Geoffrey Hibbert) reluctantly arouses himself from his bed. Coming downstairs and greeting their parents, the two share the kitchen sink to wash, then, seating themselves at the centre table, share a single hard-boiled egg with their father. It’s an unstressed moment, one suggestive less of economic constraint than of familial ritual. 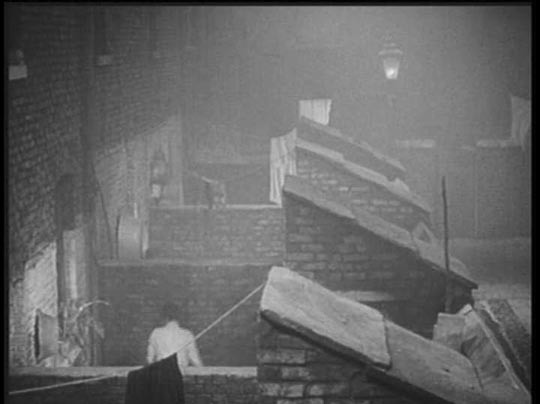 I don’t think it’s too much of a stretch to raise the comparison in these first minutes of the film to George Orwell’s book of reportage from Manchester, The Road to Wigan Pier, published in 1937. Admittedly, Orwell “wanted to see things . . . at their worst” so his descriptions of “black beetles among the tripe in the larder and blackened thumbprints on the bread,” are eschewed by Baxter’s film. All the same, when Orwell generalizes that “the Northerner has ‘grit’, he is grim, dour, plucky, warmhearted and democratic,” he could be speaking of the patriarch, Henry Hardcastle. Although the film reserves a marked tenderness for the parental figures – rewarded by the unsentimental performances of Carney and Merrall – the film’s action concentrates on their children. Harry, just 18, wants a proper suit, one that will impress his girlfriend Helen (Joyce Howard). Harry’s father – worthy of his surname – values respectability above all else and won’t tolerate “the millstone of weekly payments” to purchase new clothes for his son. Harry’s mom is made of softer stuff, however: she exceeds her husband’s authority by having the suit made on credit at the Good Samaritan Clothing Club, a small shop that doubles as a gathering place for gossip and séances, a cosy place where a portrait of Queen Victoria looks down from the fireplace and alcoholic spirits outperform the ectoplasmic kind. Sally’s workplace is not shown but her slumped shoulders and drawn face suggest her workaday existence. It is her romantic prospects that the story concentrates on. 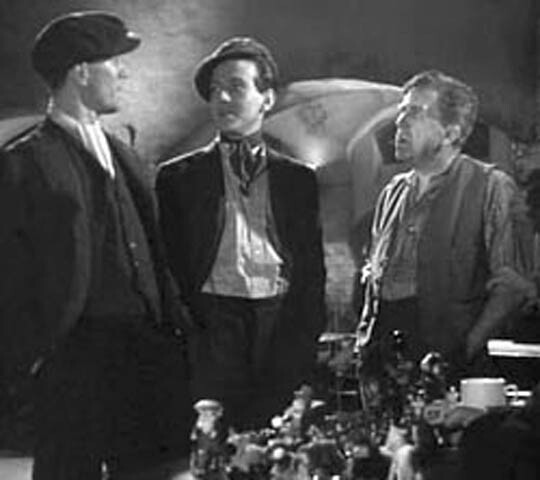 She is being courted by three men: Ned (Martin Walker), a disagreeable fellow who can’t get credit at the pub and whom Sally calls a “dirt dog”; Sam Grundy (Frank Cellier), a middle-aged bookie whose car dominates the street but towards whom Sally is immediately hostile; and Larry (Clifford Evans), an articulate fellow in the mine office who catches Sally’s attention as a speaker on behalf of the Labour Party. The impulse that drives Harry and Sally is escape from Hanky Park. Harry achieves this temporarily when he wins 22 pounds in the pools run by Sam Grundy, permitting him and Helen to vacation in Blackpool. The episode has an otherworldly quality, so swiftly does it pass as rendered by a montage of backscreen projection and library footage, although it does pause to reveal the joy with which the youngsters greet a separate indoor bathroom. 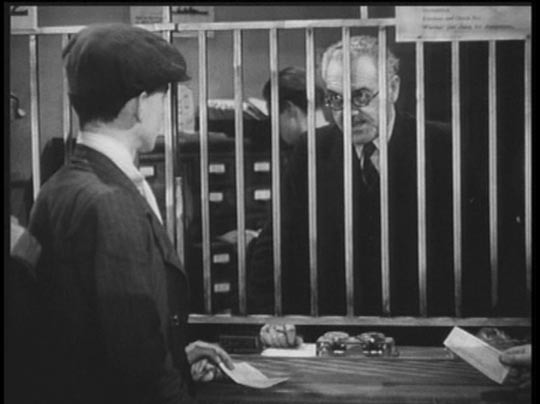 Upon returning home, Harry’s apprenticeship ends and he spends months in search of employment. Helen, now pregnant, would sooner marry Harry and live on the dole than put up with a father who comes home drunk and causes a row every night. Ultimately, rather than escaping Hanky Park, Harry and Helen are instead folded into it. Helen’s childbirth happens offscreen; only Harry’s movement from the street into his father’s home is shown. Baxter avoids a sentimental denouement; we have to imagine the pride of the still young father but perhaps also his anxiety. John Baxter was born in Foots Cray, Kent, England, in 1896, the year Birt Acres screened his Rough Seas at Dover and British cinema really began. Baxter served in an artillery company in the First World War, an experience that he evokes in a number of his films, including Lest We Forget (1934) and Men of Yesterday (1936). After the war he worked as a singer and manager of a touring theatre company. Music hall artists are recurring figures in several of Baxter’s movies and singing acts punctuate many of his films, including Say It With Flowers (1933), Music Hall (1934) and Theatre Royal (1943). By the late 1920s touring had become difficult, in part because of the new competition from talking pictures. Through a friend Baxter obtained an entry to the Sound City Studio (later Shepperton) as a casting assistant; soon he was associate director on a film about ex-soldiers, Reunion (1932). Those words summarize Baxter’s difference, although that declaration needs a qualification I’m sure Baxter would have accepted. 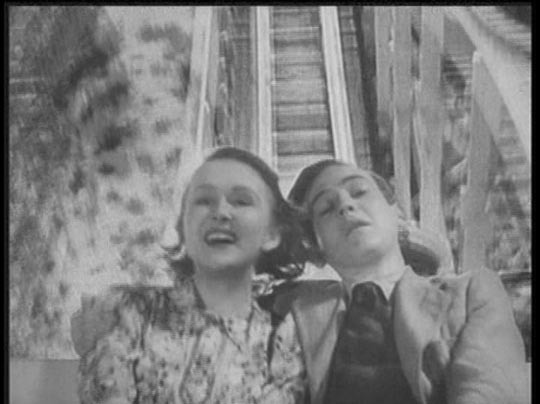 From the evidence of Love on the Dole – admittedly the only Baxter film I’ve seen – Baxter worked consciously and carefully with his collaborators. I’m thinking especially here of his cinematographer Jim (Jimmie in the credits) Wilson, who uses profile compositions and soft lighting to accentuate the dreamy idealism in Larry’s speeches, and contrastingly, an almost direct address composition and harder lighting for Sally’s confrontation with her parents at the end of the film. Also noteworthy are the numerous montage sequences created by Michael C. Chorlton, including one in which a newspaper headline dissolves to a street grate in the rain, then dissolves again to a pay wicket where Harry is handed his last pay packet and then the notice that his employment is terminated. From where is Baxter’s sensibility derived? Although there is little hint of it in the autobiographical sketch included in The Common Touch, Brown and Aldgate detect the likely source in Baxter’s religious faith. 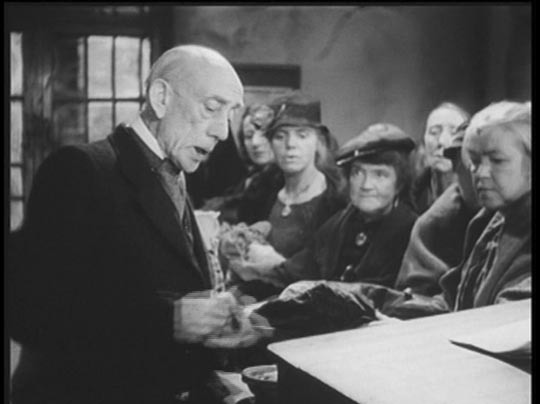 Baxter was a Christian Scientist; as the authors note, “all his most personal films are bathed in Christian charity and compassion” although only two, Hearts of Humanity (1936) and Judgment Deferred (1951), are explicitly religious in nature. Baxter’s career rather neatly divides into three periods: the apprenticeship films of the quota-quickie years (1932-1938), the period of the Second World War when Baxter worked on medium-budget movies for a more substantial company, National Pictures, and made by common consent his best films, including The Common Touch and The Shipbuilders (1943), and the post-Second World War period when it is generally admitted he lost touch with his primarily working-class audience and the films began to seem somewhat sentimental compared to the popular Gainsborough costume epics and Ealing comedies. Yet Baxter’s legacy lived on: in the 1950s a new company, Group 3, for which he produced and occasionally directed, briefly flourished with films supportive of working-class life. My initial viewing of Love on the Dole in 1978 was a 16mm print; I recently had the opportunity to view a DVD release which stimulated these notes. It is to be hoped that other films by this lesser-known but uncommonly good filmmaker will become available. This entry was posted in Commentary and tagged British Film, Directors, Film Criticism, Film History, John Baxter, William K. Everson. Bookmark the permalink.